Ask it for the impossible ! For Run Flat, low profile tyres, delicate rims... and all other passenger car, motorcycle and van wheels, as from 10'' to 23'' rim diameter (to 26'' with +3” claws). With a unique worldwide concept, the Opti-fit column uses opposite forces to push the mounting head away from the rim. Since no contact is made, you will be relieved knowing that the job has been well done. His electromechanical mounting plate ensures perfect centring and horizontal clamping (in contrast to the pneumatic system) is driven by a powerful engine. The design of the tools of the mounting head is the result of a lengthy work experience. It minimizes stress on the tyre to its lowest level! The multi-purpose Run Flat arm allows the dismounting spacer to be placed. 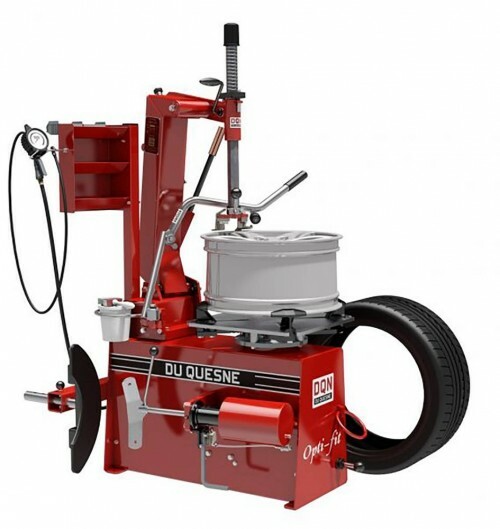 It is superbly efficient when used together with the trident for the mounting of all types of low profile and Run Flat tires. The "Trident”: Used together with the RF arm, this mounting accessory requires a mere second to be placed and helps with the mounting of the most difficult tyre types in no time. Each of these features is protected by a 'DU QUESNE' labelled patent.